After interviewing the fabulous DJ Bliss at his debut performance in the Virgin Mega Store, I felt like I needed a little pick me up for a hard days work. .......And now you do too!!!! There's nothing a little chocolate can't fix, I'm sure all my friends would agree!! The Tavola Blogger Breakfast was held this past Saturday morning in Jumeirah and all the lovely ladies from the culinary scene were there. In the picture below starting from the left are Suzanne Husseini, cook book author and Master of Modern Arabic cuisine, Ariana Bundy, cook book author, expert on alternative sweets and Modern Persian cuisine and me of course! There were a variety of snacks served, compliments of Bateel. None of this food was edible, but the beauty behind food styling is to make it look scrumptious enough to eat! Oven Roasted Quail, look at the colors and textures in this dish....AMAZING! Spinach Fettuccine with Grilled Prawns. Delicately layered pasta dripping with the creamy alfredo sauce. Painted on with perfection! I know I'm only showing you the end result, but the assembly of each dish was very interesting. A lot of work goes into food styling, I know from experience with the photo shoots I engaged in the past couple of weeks. The food stylist claimed eating the food from a food photo shoot is taboo and considered bad luck. OOPPPSSS....All of my food was edible, and every last bite was consumed! These were on a completely different scale I guess. What do you think? Moe' Baker's 30th Birthday Bash!!! Pre-Game with best party planner in town! The Birthday Boy with adorable nephew gearing up for the yummy eats and treats. Baby Khalid is always styling and tonight he's even representing his home country! The salad station was fully stocked with everything from Calamari to Asian Beef Salad, including all the traditional mezze and even a cheese platter. 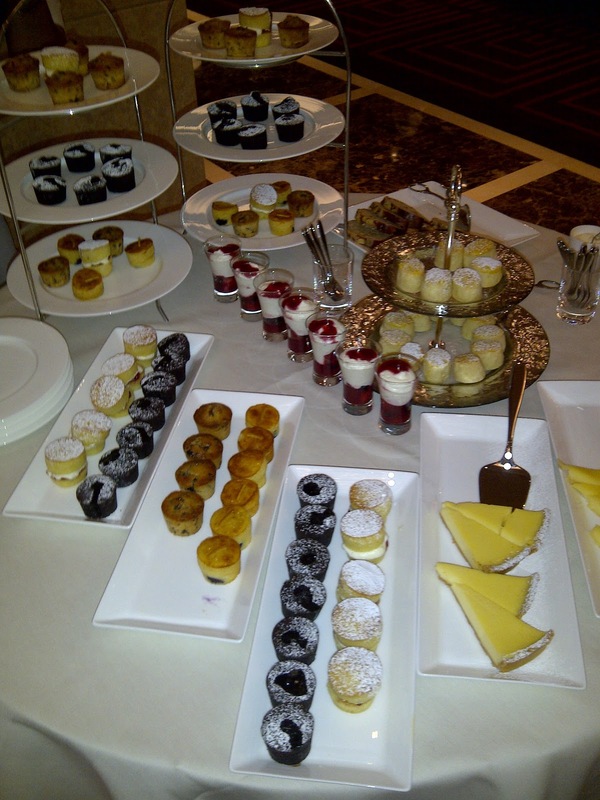 Desserts were also overwhelming, but in addition to this diverse arrangement were 4 Birthday cakes! A beautifully rich Haagen Daz Chocolate Ice Cream Cake. With layers of rich moist chocolate cake and sweet and creamy chocolate ice cream, you can't go wrong with this choice. It was also covered in a hard chocolate shell. This is a big step up from the Carvel ice cream cakes I grew up on back home. Now I have to look for an excuse to celebrate to enjoy this yummy treat again! To the right of that is the big bubble cake, also known as "Mimi's Cake" from the kitchens of Baker and Spice (Al Manzil Souk). This is a light cream and berry cake topped with rolled Marzipan and confectioner's sugar....One of my favorites!!!! You'll never go back to eating "normal" cake once you've had a taste of this beauty. Next to that is a Peanut Butter pie from Magnolia Bakery (Bloomingdale's, Dubai Mall) with an oreo cookie crumb crust, it's a sugar high like you wouldn't believe!I think this would have been my go-to dessert when I was in University. Sophisticated Junk Food at its best! 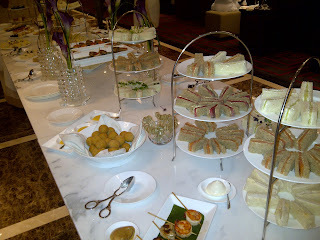 The selections of sandwiches and sweets was overwhelming, but I think we did so some serious damage! Amongst the tasty selection of savories was a thick cut Roast Beef sandwich with Horseradish Cream, Smoked Salmon and Cream Cheese, Egg Salad, and Cucumber Watercress sandwiches. A very traditional spread for an English Tea. Amongst the hot selection of food were Prawn and Chicken Satay with a peanut dipping sauce, Fish Croquettes with Hollandaise, and Duck and Cranberry Turnovers. He even had time to pose for a picture with me. Gary is very comfortable in the culinary and media scene in Dubai. He has just launched his third venue, Rhodes in Residence, an all day dining concept with in the luxury hotel Grosvenor House, Tower Two. He has also become synonymous with food festival known as Taste of Dubai which is set to launch in March 2012, and said, he couldn't imagine not being a part of it since Dubai has become his second home! After the elaborate Tea, we were also served these cute little cones with Raspberry Sorbet plus Toffee and Chocolate Ice Cream! Gary Rhodes has two established restaurants in Dubai already, Rhodes Twenty10 in Le Royal Meridien Beach Resort & Spa as well as Rhodes Mezzanine in The Grosvenor House, Tower One. The ToroToro launch at the Grosvenor House, Tower Two! Good friends + Good food = Happy Saba! 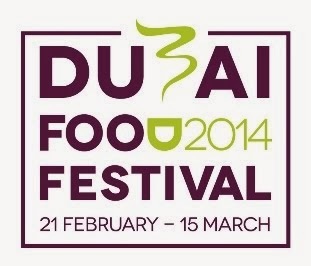 This is probably one of the biggest events in Dubai this season. It was timely, classy, and very busy! There were around 500 people on the "exclusive" guest list, with lots of familiar faces and smiles throughout the crowd. Every detail was attended to by the marketing geniuses at the Grosvenor House.....Well done Florance! The trapeze artists were a brilliant touch...I felt like I was at Carnival in Rio! The only food photos I was able to obtain were through the glass into the kitchen. I was too busy eating and catching up with people to snap pics of the decadent and delicious trays of passed Hors D'oeuvre throughout the evening. However, I did manage to catch Executive Sous of the Grosvenor House, Chef Tom Egerton in action....he's in the background of this photo, can you spot him? Preparations for Tomorrow Mornings Photo Shoot. This is the before picture....stocked fridge, semi organized workspace, and all the excitement and anticipation for the BIG day!!!! All the dishes and table ware are courtesy of Tavola. Thanks for all your help Wakami! Enjoying a lovely summer mocktail in my cute sun dress on a hot and lazy Dubai afternoon. Heirloom tomato and Onion salad, sweet, tangy, and fresh! The gorgeous textures and colors make this salad so appetizing even in its simplicity. The Salmon cake was rich, with the creamy sorrel sauce and sauteed spinach. The texture was soft and seemed to just melt in my mouth. This was definitely one of the heaviest lunches I've had in a while, and to top it off......Banana Sticky Toffee Pudding! This has got to be one of my most favorite desserts in Dubai. Sticky Toffee pudding on its own is divine, but with the added banana, its unreal! The Empanada (a stuffed bread or pastry baked or fried in many countries of Latin America and the south of Europe) selection was diverse including items ranging from chilli and corn, spinach and cheese, spiced beef, and flavorful chicken all served with a fresh tomato salsa. The mixed seafood grill was an overwhelming amount of food, but I did a pretty good job at it. 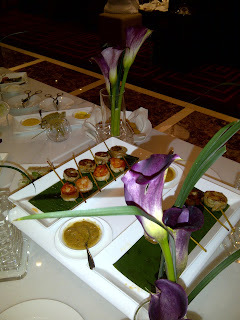 It consisted of Tiger Prawns, Salmon Fillet, Scallops, and Calamari.....what more could you ask for! This meal was also accompanied by a beautiful collection of salts from all over the world. Below is a list of what they had on offer at Asado. Pretty cool concept....If you like salt! The Palm Island Black Salt: It is obtained by craftsmen from Hawai. It is rich in minerals, black lava rocks are added to the seawater of the basins, That is why its colour is so black. Murray River Salt: It is obtained from salt flakes introduced into the salty water from the basin of Murray River (in Australia) in the ponds of cristallisation. They, then, evaporate naturally. Crystals obtained have got a nice apricot colour. Halen Môn flakes Smoked Salt: To obtain this colour and this delicate smoked smell, flakes are placed on a fire with shavings of oak. The origins of this sea salt are collected in the Atlantic Ocean close to Anglesey Island or Ynys Môn in Welsh. After enjoying the salty meal, we had to have a sweet treat to cleanse the palate. The Dulce De Leche (a thick, caramel-like milk-based sauce or spread) pancakes were the perfect end to the meal. The very talented photographer captured the textures, colors, and lighting just right. The state of my kitchen was pretty horrendous....cleaning up is my least favorite thing to do! Every last inch of counter space and every single utensil was used. I made everything from signature mocktails and starters to desserts and tea. The mains weren't too shabby either! How does a star anise and orange braised lamb shank sound?